Millennials have long had a reputation for their frivolous lifestyles and penchant for unbridled luxury. But one savvy-saver from Queensland has smashed stereotypes and managed to save a staggering $52,000 in just two years. 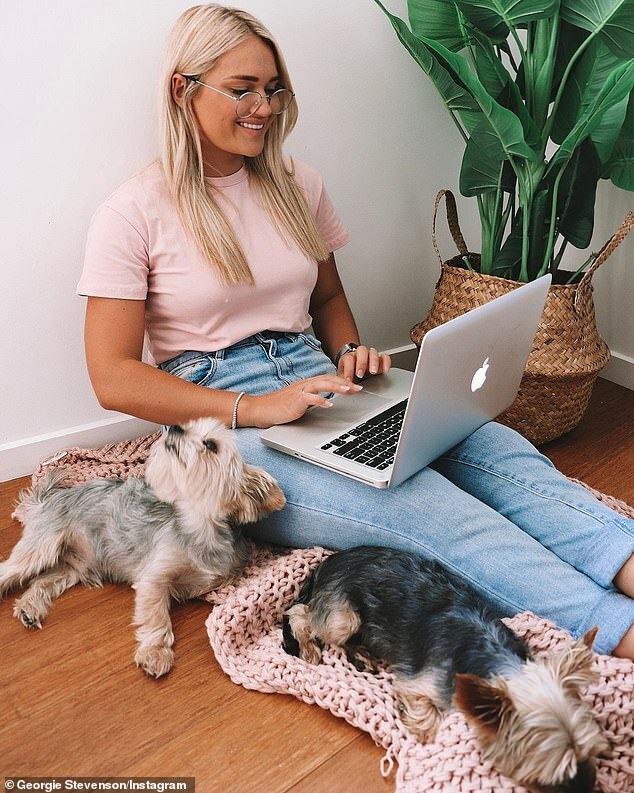 Law graduate Georgie Stevenson, 24, recently took to YouTube to share exactly how she boosted her bank account in a bid to help others to the same - and it's easier than you might think. Broken down, her efforts equated to around $500 each week, funds which Georgie put towards her wedding earlier this year before she and her husband decided to start saving for their next property. Georgie worked at a law firm and ran her burgeoning social media accounts during the savings stint, before transitioning to at-home work earlier this year. The first thing she did to save was to set up regular automatic transfers into each of her six bank accounts. Most of these are reserved for practical payments such as bills, tax and saving for a new home - but it also makes room for guilt free spending. However, while Georgie admits it seemed like a foreign tactic at the start, the benefits largely outweighed the restriction. 'It was a little bit difficult at the start like setting dates and everything but now it's the best thing I ever did,' she said. Like the health and wellness lifestyle Georgie lauds, she also advocates for balance when it comes to saving and spending. By setting boundaries or clear rules to abide by the couple know how and when to make their savings. For her own life, this equates to ordering-in food a maximum of three times a week and limiting the number of times they dine out also. Another rule is to avoid running to the supermarket for just a few items and instead favour a bigger shop once or twice each week. While university students are famed for their ability to make each dollar stretch, this habit can fall by the wayside when millennials enter the professional workforce. According to Georgie, staying with the habits learned while earning a lower wage comes in handy when a higher money bracket is reached. 'A lot of people get stuck in this trap, they start earning a bit more money, it starts becoming a bit more stable and all of the thrifty things they do to save money go out the window because they a little bit more leniency,' she said. Founded on her belief of the law of attraction, Georgie said having a positive mindset toward money and saving. She likens this to losing weight and how important a proactive approach is to achieving goals set in this realm. 'When I'm spending money and I almost feel a bit nervous to spend it, I always say to myself "there's more money where that came from",' she explained. To keep up with Georgie on Instagram, click here.